German pianist and composer Volker Bertelmann has made quite a name for himself as Hauschka, a usually one-man show that finds Bertelmann performing on a prepared grand piano. He wedges ordinary objects like screws and foil within every part of a piano’s insides in order to get a unique sound that he then runs through a few live electronics and the result is what he calls an "acoustic synthesizer". The sound is beautiful and near-infinitely varied as it switches from a full piano sound to industrial plucks, and even presents the illusions of drumsets, strings, and even clarinet for a few seconds at a time. His newest album Abandoned City is inspired by real-world ghost towns all over the globe and sets the tone for gritty ostinatos and simple, airy melodies that are peppered throughout the album, and although each track is highly personalized and expertly organized I find myself wondering why there are overwhelming 4-on-the-floor pulses present in an album about abandoned places. 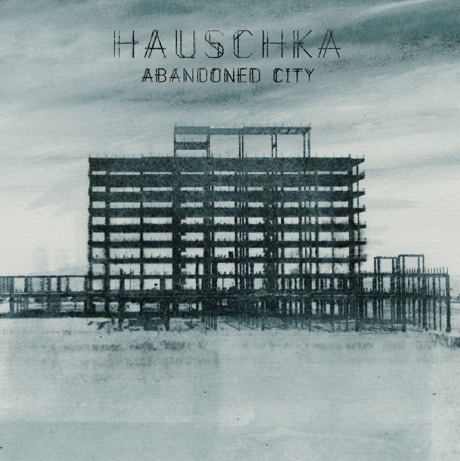 People often draw lines between the music of Hauschka and American composer John Cage on the simple grounds that both of them worked with prepared pianos. However, Bertelmann has a dance/techno background alongside a knowledge of classical piano which separate him from the ideological intensity and intentions of the avant-garde Cage. Aside from calling his second album The Prepared Piano in reference to Cage’s own work the two could not be more different. Bertelmann’s goal was, ostensibly, to explore a new soundscape through which to channel his inner IDM and ultimately generate an effect onto his audience. It shows in his use of pulse, hummable melodies, and melodic use of these very strange effects that this music is not here to make a statement. Rather it was made to be listened to and enjoyed. The music brightens homes, parties, concert halls, coffee shops, and can be listened to by anyone even if they have no interest in anything "classical". Simple melodies become part of complex systems as layer upon layer is added in a tantalizing fashion and keeps you engaged in the music without becoming lost. Conversely, Cage’s music is about the idea that drives the work and the unique results that come from chance, blind collaboration, and perhaps most importantly from the reactions of his audience. Cage describes his famous 4’33’’ in terms of the sounds his audience made during its premiere. Abandoned City has an idea behind it but it is centered in the physical world in a way that Cage’s work is not. Abandoned City weighs in at around 43 minutes and is full to the brim with enticing patterns in every track. It opens with “Elizabeth Bay” which bears a dark, industrial atmosphere which has me immediately paying attention. Although there is a pulse, it’s so punctuated and in the foreground that it almost functions as melody where otherworldly notes come in like harmonizations to an incomprehensible chord. I get a sense of the buildings, the rhythms dotting my entire field of view and I feel caught up in the loneliness of it. Echoes feature prominently, even sharp wiry ones follow close after the full sound of the unaffected parts of the piano. It’s a vivid image and captures perfectly what this album is about. “Pripayat”, the second track sounds like an old jack-in-the box that was forgotten and yet still turns. It is a haunting image that is at a sharp contrast to pieces like “Thames Town” which sound like an underground house party has set up shop and continues to play to noone. I find it odd that Bertelmann chooses to have such strong pulses in pieces about abandoned cities, and even if the reason were to be that a certain character and lifeblood still flows through these buildings and that he ‘can just sense them’ it takes away from my ability to get lost within the complexities and peculiarities of each work. For example, “Who Lived Here?” which impossibly sounds like it has cello and clarinets in it, avoids use of the techno vocabulary and draws the listener in. Repeating oscillations in the high register undulate as shambling lows and ends continue to build up throughout the piece. This is not to say that tracks like “Agdam” and “Barkersville” are unwelcome or even remotely bad. They’re well made, fun, and full of mood. They are just a little obvious, they don’t showcase Bertelmann’s ingenuity and weaken the effect that his stronger tracks have on the listener. They keep finding civilization where there should be none. “Barkersville” has times where it sounds like an odd, almost empty jazz tune and as soon as it begins to expand on that excellent atmosphere it brings in an unrelenting beat. “Stromness”, the last track on the album does a good job of combining this “classical” feel with the pacing of a techno track by moving back and forth between identities before meshing them together and holding the pulse back in such a way that it blends with the rest of the material. The ideas and materials in Abandoned City are sound and as strong as ever but it seems that they are pushing back against some of Bartelmann’s club-borne crutches. This piano is his voice and it can only get more interesting from here. Abandoned City comes out March 18 and is available for streaming at HypeMachine.